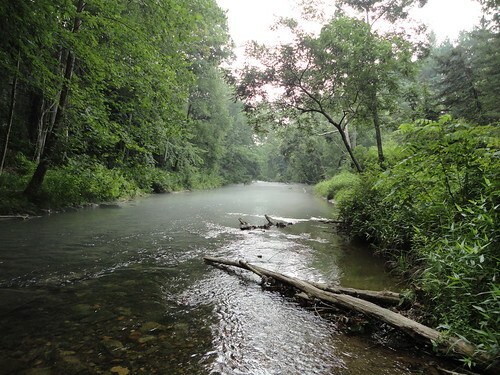 The heat this week is approaching triple digits, but the Gunpowder River is still well below the threshold where trout become stressed by warm water. The upper reaches are still below 50 degrees in the morning, and may climb into the sixties in the mid to lower accesses of the catch and release sections. Areas below Bluemount Rd are likely to be too warm for fishing, so consider taking a water temp before fishing. Generally the trout become less active once the water gets into the 68-70 degree range, so fishing farther up river will be far more productive, and less stressful on the trout. The cooler water temps along the Gunpowder really drop the ambient air temps, and the rolling fog and a slight breeze act as air conditioning. In weather like this when yard work is a miserable chore, fishing can still be a way to cool off, and get out of the house. I fished quite often over the past weeks in fluctuating flows, before taking a non fishing hiatus to the beach. 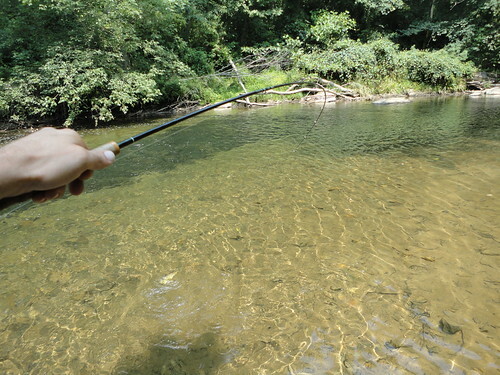 I returned to low water, and decided to dust off a smaller 7 foot 3 weight fiber glass rod. I knew of a few good riffles holding lots of trout, and fished a small caddis dry on a long leader. Fish were taking caddis sporadically, but would hammer the fly on the first drift. In one run I rose ten fish without moving a step, landing five browns. The 8-11 inch fish really put a bend in the fiberglass rod. The most productive areas were the faster runs and riffles where the trout wouldn’t spook as easily. In the flatter, shallow sections I watched as trout spooked from as far as sixty feet away. In some cases I watched fish dart for cover before my boots got wet. Avoiding these areas and focusing on the deeper areas will result in better fishing. In the lower flows it can be feast or famine in terms of catching trout, but in some areas it can be quite productive. On a different day I spent an hour fishing where a lot of smaller trout hold, armed my six foot one weight Scott Fiber Touch rod. The rod and smooth drag on the reel was a blast on the 6-10 inch trout. I only saw one other angler between the two days on the water. Despite the low flows and excessive heat, the river is fishing well. The latest video post features some wild browns I caught on fiberglass rods. This entry was posted in fishing report, video on July 21, 2011 by Jason du Pont.